It&apos;s only be out for little over a month now, but the adidas Energy Boost is already getting a new look to compliment its high voltage performance capacity. If you&apos;ve read the Sneaker Report review of the Boost, then you know just how fond of it we are. Engineered for speed—and lots of it—the Boost technology is just as advertised. It&apos;s comfortable, provides excellent energy return, and, well, it&apos;s just plain fun to run in. Now, adidas is rolling out a Prime Blue version of the sneaker, to go with the Black and Eed colorways already available. And it just might be the best one yet. 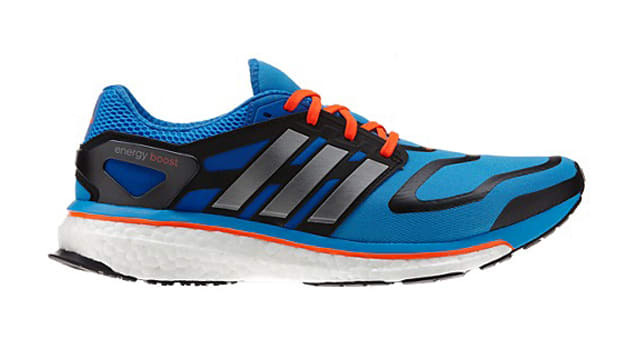 Runners who want to get their feet into a pair can pre-order a pair at adidas. It arrives on April 15.